Heart failure means that your heart isn’t pumping blood properly. Your heart still beats, but its ability to pump blood throughout your body isn’t being met. As a result, blood can back up in your veins, and fluid can build up in your body, leading to “edema,” or swelling in your feet, ankles, and legs. If fluid builds up in your lungs, you can experience “pulmonary edema,” which can lead to difficulty breathing. When suffering from heart failure, your body doesn’t get enough blood and oxygen. There is no one single cause for heart failure. There are many potential sources, including coronary artery disease, or CAD. CAD is a disease of the arteries that supply blood and oxygen to the heart, causes decreased blood flow to the heart muscle. At Phoenix Cardiac Surgery we are leading innovations in alternatives to heart transplants. One option is the Left Ventricular Assist Device (LVAD). 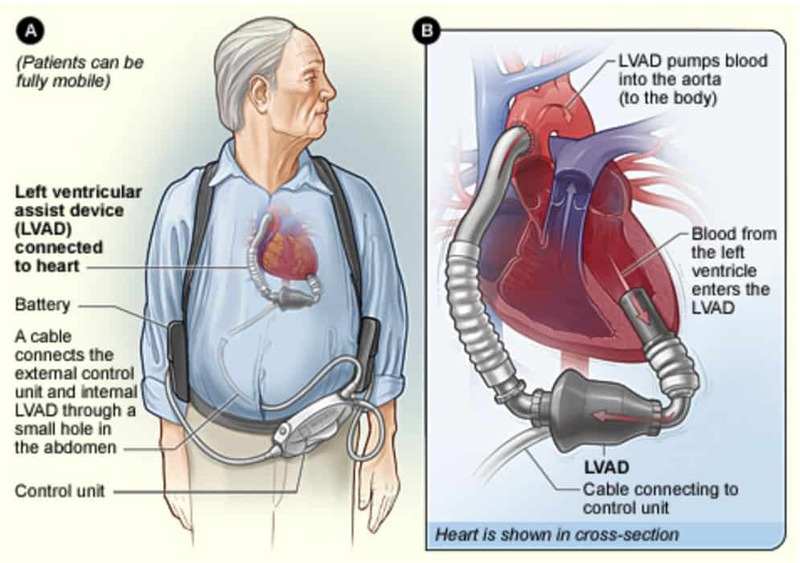 The LVAD is a mechanical pump that assists a failing left ventricle which is the chamber of the heart responsible for providing blood flow to the body. Placement of this device requires an open heart surgery. Surgically attached to the left ventricle and the ascending aorta (the artery that receives the blood from the left ventricle and disperses it to the body), the LVAD assists by continuously pumping blood out of the left ventricle and into the ascending aorta, thereby assisting the failing left ventricle. Patients must wear the equipment continuously but can be fully mobile. Talk with your doctor about how you can best treat your heart disease. More information about heart failure is available from The American Heart Association.